Last weekend I wanted to spend some days on the beach and decided to go to Puerto Lopez – a wonderful place on Ecuador’s Pacific Coast that offers a perfect combination of relaxing near the ocean and doing different interesting day activities. When I arrived Saturday morning I was happy to check into my hotel directly on the beach. The hotel offered tours to Isla de la Plata, including whale watching, snorkeling and lunch, so I decided to book a tour for Sunday directly at the hotel. 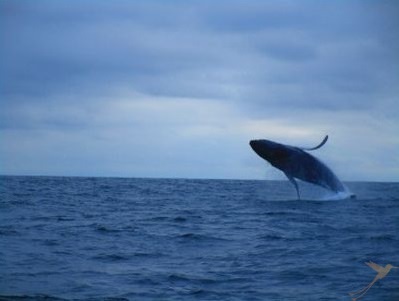 It is very easy to organize the trip, because there are tour operators at every corner. They all offer more or less the same tours for a similar price. After having breakfast I walked to the harbor and encountered a group of Germans who wanted to go to the beautiful beach “Los Frailes” in the Machalilla National Park. An Ecuadorian guy we met took us in his car directly to the beach. The ride took about 15 minutes and the entrance to the national park was free. If you go by bus you have to take a taxi to the terminal and catch the local bus there to the entrance of Machalilla. You need to get some food and drinks before you leave, because there are just a few possibilities to buy something. 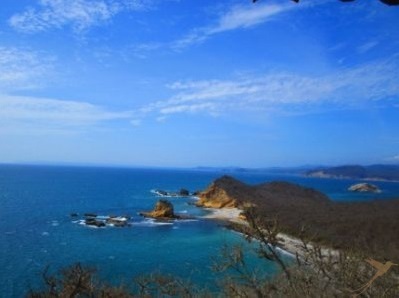 On the rocks nearby you can find observation decks with a breathtaking view of “Los Frailes”. It’s great to walk up there if you don’t want to spend all day on the beach. At 4 pm I left the national park and went back to Puerto Lopez. I had some awesome Ceviche Mixto, which you should definitely try on the coast. In the evening Puerto Lopez gives you the chance for hanging around in the hammocks of the bars directly on the beach. A great place for finishing the day. On Sunday at 9.20 am I started my booked tour. The guide picked me up at the hotel and took me to Puerto Lopez’ port where I had to pay $ 1 for the embarking. We went in a group of 15 people on a small speedboat and started our trip to the Isla de la Plata. The ride took about 1.5 hours and on our way we wanted to observe the whales. Unfortunately we weren’t very lucky so we went first to discover the island. 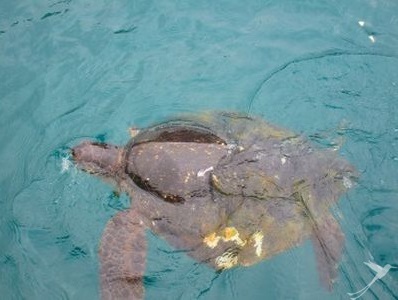 The Isla de la Plata is a small island off the coast of Manabí and is part of the Parque Nacional de Machalilla. 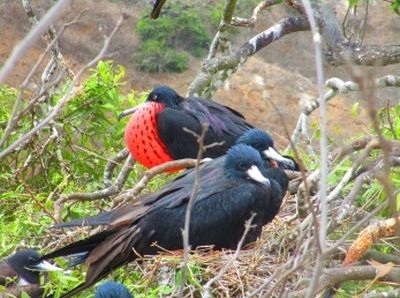 You can find a large diversity of animal species, for example blue-footed and Nazca boobies, sea lions, frigate birds, snakes, pelicans, lizards and green tortoises. On the island you can choose between different trails, depending on your physical condition, the group you are traveling with and the time you have. After one more hour in the boat, I arrived in Puerto Lopez again where I had time to enjoy one last drink before beginning the journey back to Quito, giving me the time to reflect upon my trip: I saw a lot of new animals and spent some great hours at the beach. I wish I could have stayed longer at this beautiful place and could have enjoyed more activities of the surroundings. Maybe I will come back in some weeks again! If you did not get enough of beaches and in particular Isla de la Plata and Puerto Lopez you should check out Ruta del Sol Tour.